People lined up for samples at last year's Hereford Association display. Consumers sample the recipes during the Battle of the Breeds. 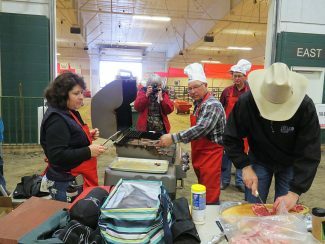 The Angus Association prepares a steak for grilling during the Battle of the Breeds at last year's Classic. This year's Nebraska Classic will kick off with a ranch horse versatility competition, team and open roping events, and a ranch rodeo. New to the horse event lineup, the Classic has teamed up with the Nebraska Draft Horse Association, and will hold draft horse feed team races Feb. 18, after the ranch rodeo. The Nebraska Classic will be held at the Buffalo County Fairgrounds in Kearney, Neb., February 18-26. With the opening weekend featuring horse events, Classic Manager Ronette Bush-Heinrich says a Rustic Cowboy Mercantile has been added that features a unique shopping experience, as well as some different antiques, the entire family can enjoy. On Feb. 19, the public is welcome to attend cowboy church at 8 a.m, followed by the day's events including a working cow horse competition and a cataloged ranch horse sale, featuring 21 quality ranch horses. The National Cattledog Association will hold working dog trials beginning at 8:30 a.m. on Feb. 20. At noon, cattlemen can enjoy a Classic Luncheon. The career fair is a new event this year designed for college students. The event will be held Jan. 20 in the Expo Building from 10 a.m. to 4 p.m. During the career fair, college students seeking careers in agriculture can visit with representatives from nearly 50 businesses to discover what opportunities are out there, Bush-Heinrich said. Representatives from animal health companies, feed companies, financial companies and ranchers are among those expected for this event. "The Classic Career Fair will also feature displays from ranchers that offer internships," she said. 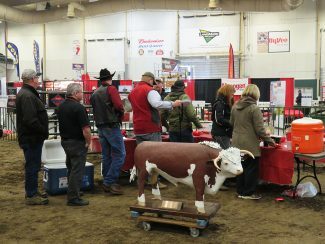 "This event offers connection opportunities with youth seeking careers in agriculture and the beef industry." Students are also welcome to attend a free luncheon, and hear from a panel of professionals with careers in agriculture. "These panelists will provide insight into finding a job or internship," she said. Feb. 21 is Cattlemen and Consumer Day at The Classic. Another new event this year is the FCS/Prostart Cooking contest. This is a beef culinary competition for Nebraska high school students, where they will not only learn more about beef cuts, but cooking methods. Students who compete in this contest will be eligible for cash and other awards. Competitors can enter two events — beef appetizers and beef entree. A steak cook-off will also be held Feb. 21, as well as the Battle of the Breeds, which is a social evening event held in the showring. 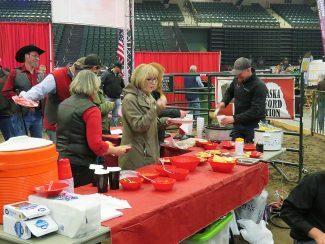 During the Battle of the Breeds, each breed association makes their favorite beef recipes and serves them to the public. The public votes to determine which recipe is their favorite. 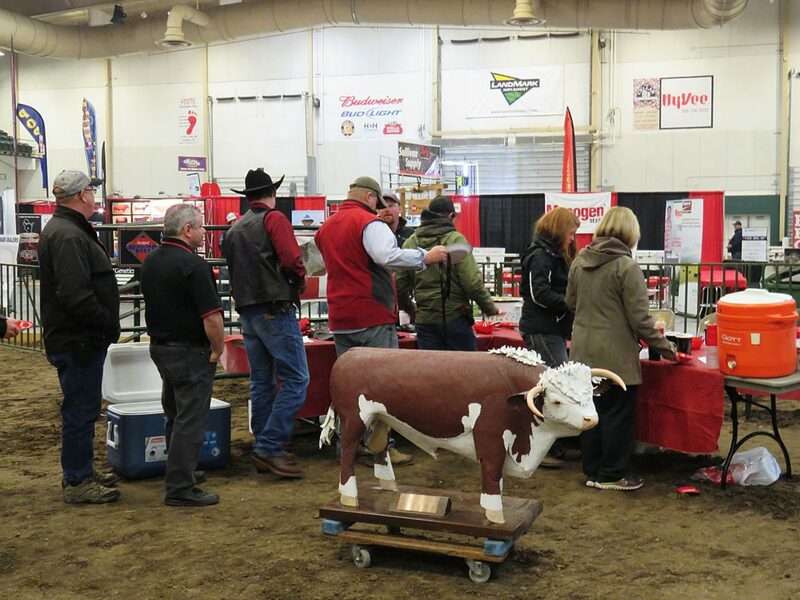 The cattle shows are underway on Feb. 22, with nearly 400 head of bulls, bred heifers and fancy open heifers that will be showcased over the next three days. Feb. 22 will feature Hereford, Polled Hereford and Red Angus. Feb. 23 will feature Angus, Simmental, Charolais, Limousin and Gelbvieh. Feb. 24 will wrap up the open cattle shows with Shorthorn, Maine Anjou, Chianina, and the commercial pen of five heifer sale. Feb. 24 will also feature a used show equipment swap meet, where cattlemen can buy and sell good used show equipment. "This new event is a great opportunity for beginning showmen to purchase equipment," Bush-Heinrich said. The supreme champion bull and heifer will be chosen on Feb. 25 from the grand champion bulls and heifers in each of the breeds. In this event, the consignor of the bull or heifer named supreme champion will receive $2,500, and the buyer of the animal will receive $1,000. The final weekend of the Classic features the next generation of showmen, Bush-Heinrich said. A prospect steer and heifer sale will be held that provides scholarship opportunities for youth. "The Classic will present over $8,000 in scholarships to youth that purchased a steer or heifer at the 2016 sales," she said. "This program provides youth with opportunities to participate in feedlot tours, complete record books, and compete in an interview on their project." In addition, over 350 youth throughout the nation will compete in a livestock judging contest, showcasing Nebraska's beef. During the Classic, participants should plan on visiting the Classic Marketplace, with over 125 commercial ag-related vendors. "Cattlemen have the opportunity to win $500 in Classic Cash on Feb. 21, only," Bush-Heinrich said. "Cattlemen attending the Classic on this day will get their name in a Classic drawing at 2 p.m. One individual will win $500 Classic Cash that will be redeemable with any purchase at the 2017 Classic cattle sales."